The Historic Centre of Cordoba comprises its Mosque-Cathedral and surrounding quarters, a testimony to its blossoming during the islamic Caliphate of Cordoba. In 711 AD, Cordoba - as many other Andalusian cities - was conquered by the Moors. They turned the city into a cultural haven, with plentiful mosques and palaces. 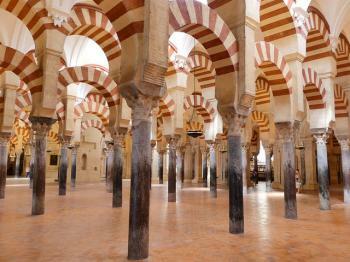 The large Cordoba Mosque was modelled after the one in Damascus, and is a real masterpiece. The surrounding neighbourhood formed the heart of the city. In 1236 Cordoba got Christian again. The Mosque was turned into a Cathedral. The heat! That is what comes up in my mind when I think of Cordoba. We were roaming around empty streets, visiting sites like a synagogue, when it struck us: what are we doing? The temperature had reached 46 degrees Celsius. The remaining days in Cordoba we spent at a terrace and in our hotelroom. I visited this WHS in September 2017. Together with Granada (and most probably Seville), this WHS is not only Andalucia's highlight but perhaps Spain's if not Europe's. It has definitely earned its place on my personal top 100 WHS. 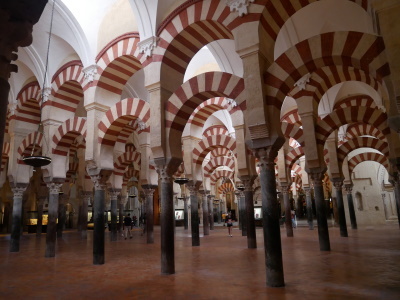 The iconic red and white arches of the Mezquita are so iconic (photo) and there are hundreds of them in the gigantic mosque-cathedral of Cordoba. But Cordoba is much more than that. The exterior of the huge Mezquita is as impressive as its interior. I particularly enjoyed the different puertas with their intricate red and white carvings and doors. Another gem is the 15th century Capilla Mudejar de San Bartolome, neatly hidden amidst the famous shaded patios with numerous pots and plants. The view from the bridge and tower are worth taking in. Perhaps the best thing about Cordoba is that it has a natural buffer surrounding it which is the Sotos de la Albolafia Natural Park. There's a short trail which takes you from one mill to the next on the Guadalquivir river banks. The UNESCO WHS inscription plaque is just to the left of the bridge (if you cross the bridge facing the Mezquita). If you love gardens, then go for a short visit to the Alcazar de los Reyes Cristianos (closed on Mondays). Even though the entrance to the Mezquita costs 8 euros, you can visit for free from 08:30 to 10:00 every day. After your visit to the Mezquita, make sure to pop in Casa Santos for a generous helping of their signature tortilla de patatas and a beer. I had a great time in Cordoba and I'll most probably revisit soon when I return to Andalucia to visit Seville and Donana NP. The Mezquita is one of Spain's (and Europe's) finest tourist attractions, and a fascinating reminder of the period of Arab rule over large parts of Southern Europe. Córdoba at that time was a lot bigger than today, and the capital of a large empire stretching well into North Africa. The Mezquita was the major mosque in the western part of the Muslim domain, and one of the largest anywhere. It includes a very big courtyard and is especially famous for its 856 columns. After the reconquest, it was turned into a cathedral, and during the Renaissance, a nave was built in its centre. Today it is a fascinating mixture of Islamic and Christian architecture. The mihrad (prayer niche) especially is still very well preserved, and there are some remains of the Visigothic church of San Vicente, which preceded the mosque. 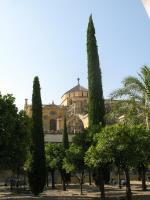 The Mezquita was inscribed in 1984, and the site was extended in 1994 to include the entire Historic Centre. This is also quite nice, but nothing really special. There is a Roman bridge (at least the foundations are still Roman), a medieval tower on the other end of the bridge with a somewhat tacky museum, a very small synagogue (one of only three or four remaining in Spain), the Judería district with many historic palaces and townhouses, and, as the city's major sight next to the Mezquita, the Alcázar de los Reyes Cristianos, a major palace with beautiful gardens. It was the royal residence where the reconquest of Granada was planned and where Columbus presented his plan for a voyage to India (or America, as it turned out). The fascinating ruins of Medina Azahara (Madinat al-Zahra) are close by and add an additional facet to the story of Córdoba. I visited the Mezquita and the architecture of the former mosque was amazing. It is also good place to hide hot weather. It was +41 celsius outside but inside the Mezquita was nice and cool. The streets of the old town are narrow and nicely confusing. I wandered there for long time finding beautiful streets. The cathedral in Cordoba was the single most impressive monument I saw on my brief trip around western Andalucía. It is one of the greatest architectural achievements I have visited and really is worthy of the great praise and visitors it receives. The famous horseshoe arches are incredible and you can really get a great feel for the architectural forces of the building. The much-maligned Christian additions to the mosque were also quite impressive, though under restoration when I visited. It was a major tourist attraction but it was surprising how you can lose tour groups in the forest of pillars, you can also get a pretty decent guided tour by just moving from one group to the next never hearing more than a few phrases from each. Throughout the historic centre it felt quite hard to get away from areas that were touristy and discover a slightly more authentic side to the city. The centre is very reminiscent of North African medinas, but walking through you would sometimes struggle to find clues that the reconquest has happened as everything sells itself on Moroccan themes. It was very nice but a little false. Though the Banos Arabes (Arab Baths) were a nice treat. Also the food was very good, a recommendation goes to Almatea, which had a great selection of local organic produce and a decent vegetarian menu, which can be hard to come by in this part of Spain. It overlooks the Roman bridge, and I have to agree with Philip below that it has been over restored it is just essentially a new bridge. That said the whole of the centre was well preserved and certainly worthy of a place on the WHS, and the cathedral is exceptional, one of the finest buildings I have visited, so it is worth going out of your way for. Of all the places I visited in Spain, this area was my favorite. The mosque is absolutely stunning both in beauty and sheer architectural prowess. I was so upset when my camera died and I didn`t get more than 3 pictures! Though you need to watch for gypsies and pickpockets, wandering around the area a bit is a good idea... if you can, peer into the houses nearby to view their characteristic patio. ...I remember thinking when I went I wanted a house just like those someday. Impressive Synagogue changed to a Christian church but keeping the Muslin atmosphere. The rest is normal and may be seen in other spanish cities. 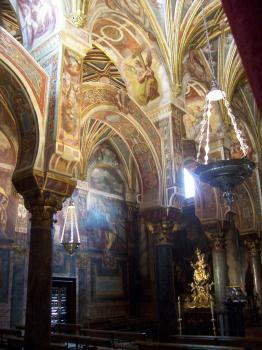 Visited in summer 2007 and must admire this is my most favorite Andalusian site. 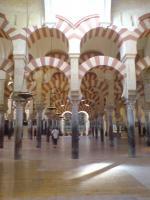 Before you visit please read some texts about Cordoba, it will help you to understand a bit. The city has it very own atmosfere which we could feel as we arrived right before sunset. Visiting then the Gardens of Alcazar gives you a great oportunity to feel like an emir :) (on friday night for free). Walking around night in old jewish city through all those narrow street is a great opportunity to breath the city itself. Next morning we were able to get to Mezquita for free (you have to go there when the mass is happening). This building from outside doesn't look anything special, but once you see all those forrest of pillars you understand. Pillars everywhere are except the site of cathedral built in middle :( Quite unfortunate decision but time approved those two styles can live together. After this we had delicious Churros on La Plaza de La Corredera - dont miss it - looks similar as Plaza Mayor in Madrid. On the way to Seville from Madrid, we stopped by Cordoba for a 3 hour visit. The main sites of the town are the Mosque/Cathedral and the Alcazar. We visited both and I was very impressed with what I saw. The former is not only beautiful but gigantic as well. It is interesting to see the mix of Islamic and Christian designs. Restoration work was taking place both on the interior and exterior and it was crowded but I greatly enjoyed my visit regardless. Best of all, there was no admission fee before ten o'clock. The Alcazar was equally amazing with its ancient baths, towers and beautiful garden. At the time of our visit, the Roman bridge was under restoration and could not be crossed. Personally, I have mixed feelings about the restoration. Looking at old pictures, the bridge looked a lot better unrestored. The restoration has dramatically changed its appearance; it looks like it was built just yesterday nowadays. If it could be done again, I would have stayed a lot longer. Unfortunately, I did not have the chance to visit the Jewish quarter and its synagogue (one of only three ancient ones surviving in Spain, the other 2 being in Toledo). Cordoba was a great introduction to Andalusia and I would enjoy two other WHS (Seville and Alhambra) later on which gave me a positive outlook of the region. Baths: "Banos arabes" Wiki - "Many tourists visit the Arab baths, which were actually built under Alfonso XI"
Charles V: "The most significant alteration was building a Renaissance cathedral nave in the middle of the structure. It was constructed by permission of Charles V"
Mosques converted from churches , cathedrals or synagogues: Was a Visigoth church before being converted to a mosque in 784. Became a Church again in 1236. Former Largest Cities: From 920-1000 A.D.
380 Community Members have visited.